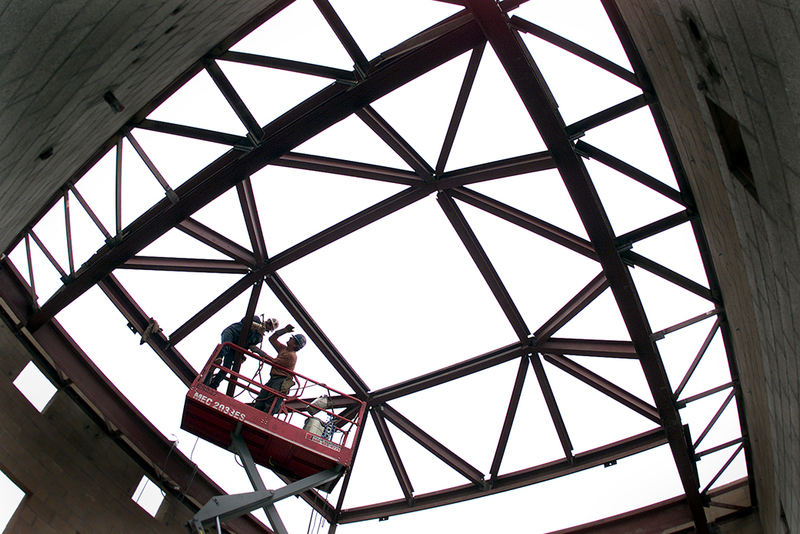 Iron workers weld metal beams on a new building being constructed in Oxnard, California. Job quality standards should apply to all taxpayer-supported work regardless of whether it is financed through federal contracts, grants, loans, or even tax incentives. Policymakers who care about workers must defend existing job protections from attacks and fight to strengthen policies to ensure that all government spending creates good jobs. Over the past century, American policymakers developed a series of protections to ensure that companies receiving federal funds pay their workers market wages, provide good benefits and equal opportunity for all workers, and allow workers to join together in unions. Federal lawmakers also enacted protections to ensure that many of the jobs created by this spending are created in the United States. 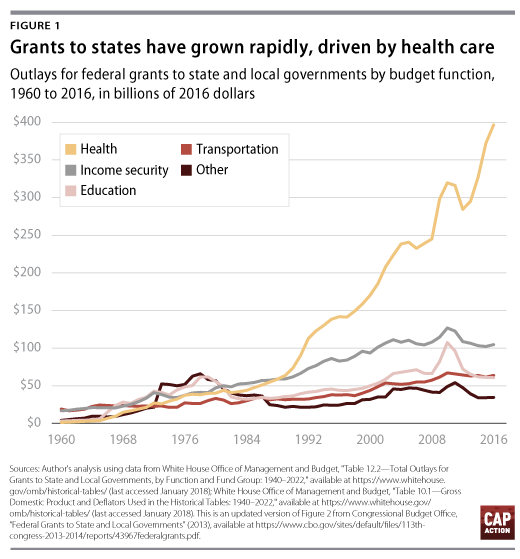 As the government’s spending footprint grew, lawmakers expanded protections that originally applied only to contracted construction work to new industries and new spending vehicles. The trouble is that today, there is an uneven patchwork of workplace standards for companies receiving government support. While workers on jobs funded through federal contracting dollars enjoy numerous wage and benefit protections, these policies usually do not apply to jobs funded through federal grants, loans, loan guarantees, and tax incentives. Moreover, existing policies are too weak, allowing companies receiving contracts to fight vehemently against workers’ efforts to form unions and, too often, to pay them far below a living wage. And while the United States has numerous policies to promote contracting in ways that create American jobs, standards designed to ensure that the federal government purchases American-made products are too often poorly enforced and cover a limited number of spending programs as well as a limited number of end products. Worse, the Trump administration and some Republicans in Congress are acting to dismantle job quality protections for taxpayer-funded jobs. President Donald Trump has already signed legislation eliminating protections for contracted workers.4 Moreover, anti-worker lawmakers have introduced legislation to weaken and even repeal prevailing-wage laws.5 Pro-worker lawmakers should fight against all efforts to destroy standards for workers. Beyond these imminent battles, lawmakers should embrace a bold vision to ensure that all government spending—including federal contracts, grants, loans, loan guarantee programs, and tax incentives—creates good jobs and provides new tools to build power and voice for working Americans. The text box below lists all standards that should be guaranteed for jobs funded through federal spending. Congress will have opportunities to implement these protections. President Trump promised $1 trillion investment in infrastructure and will soon announce a more detailed infrastructure plan.7 While Trump thus far has failed to commit to including wage protections on all jobs created through the package, lawmakers who support workers should ensure that any infrastructure package creates good jobs for all taxpayer-supported work, including all work funded by public-private partnerships. Raising standards in this way will not only help working people but will also ensure that businesses that respect their workers can compete on an even playing field—and ensure that taxpayers get a good value for their investment. After Maryland implemented a contractor wage standard, for example, the average number of bids from companies for state contracts increased nearly 30 percent.8 Nearly half of contractors said that the new standards encouraged them to bid because they leveled the playing field. In order to build support for these policies, this report provides a history of American policies to ensure that government spending creates good jobs; an explanation of the problems with the current system; policy recommendations; and evidence showing that high standards benefit workers, business, and taxpayers. To be sure, enacting these policies at the federal level will be difficult. However, by fighting to ensure that these standards are attached to all jobs created through an infrastructure package, and by opposing efforts to weaken standards, policymakers can show they are serious about ensuring that working families can access decent jobs that pay middle-class wages, as well as demonstrate that they understand the magnitude of problems facing working Americans. American policymakers have long taken the stance that when government supports private-sector jobs, it should function “as a model employer to be emulated by the private sector.”9 Throughout the past century, policymakers instituted laws to ensure that companies receiving government support provide workers decent wages and benefits, are safe and free from discrimination, and give their employees a fair shot at coming together in unions. While most existing standards are aimed only at jobs created through federal contract spending, in specific instances, the federal government has also adopted policies to raise standards for jobs funded through other types of federally assisted financial support. These standards provided the foundation for federal reforms first initiated at the outset of World War I and then throughout the Great Depression. Five years later, in 1936, with the passage of the Walsh-Healey Act, prevailing-wage protections were extended to contractors manufacturing goods for the federal government. Moreover, the government was in many cases the largest buyer by far in the marketplace and thereby had the power to set the market rate for goods, services, and labor. The danger thus existed that the government could lower wage standards for nonfederal contract workers below that which would be paid by the market. While jobs created through the federal procurement system enjoy the most extensive protections, in specific instances, the federal government has also adopted policies to raise standards for jobs funded through grants, loans, loan guarantees, and even tax incentive programs. Most notably, Congress has regularly extended construction wage and benefits standards for contracted companies to other types of financial assistance. Since enactment of the Davis-Bacon Act in 1931, Congress has frequently enacted “Related Acts,” which attach prevailing-wage standards for construction work across a variety of types of spending programs, including grants, loans, loan guarantees, mortgage insurance, and tax incentive programs. While this is a piecemeal approach—rather than a consistent presumption that new grant, loan, and tax incentive programs will include prevailing-wage protections—Congress has enacted approximately 60 related acts.32 Frequently, these standards are applied to government-supported transportation and infrastructure projects, but these standards have also been extended to the construction of housing, hospitals, and veterans’ homes; arts projects; and wastewater treatment facilities. The text box below provides a sampling of the types of programs to which Davis-Bacon provisions apply. Taken together, these actions could eliminate job protections that have been developed for taxpayer-funded work over the past century and result in significantly lower wages for American workers on federal projects. While the Trump administration and anti-worker lawmakers in Congress represent an immediate threat to existing federal job standards on taxpayer-supported work, the current system is far from perfect. Workers on jobs funded through federal contracting dollars enjoy numerous wage and benefit protections, but these policies frequently do not apply to workers on jobs funded through other spending programs. As a result, existing job standards cover less than half of all government spending on contracts, grants, loans, and tax incentives. In addition, existing job quality standards too often pay very low wages, do not protect workers attempting to form a union from employer opposition, and leave workers with little power to negotiate for better wages and benefits. While Congress has regularly extended Davis-Bacon protections on transportation and infrastructure funding, it has not taken parallel action to extend the Service Contract Act or other types of job protections to nonprocurement spending.44 And even when Davis-Bacon standards apply to construction work, ongoing work associated with a project may not be covered. For example, public-private partnerships are typically structured so that maintenance and operations jobs are not covered by any sort of wage standards.45 As a result, millions of other federally supported service-sector jobs are not covered by wage and benefit standards. Yet it is still far too easy for anti-union companies to fight workers’ efforts to join together in unions and negotiate for better pay and benefits. While existing government policies prohibit companies from using federal funds to fight workers’ efforts to form unions, they are free to use their own funds to do so. This unequal distribution of power harms middle-class Americans throughout the economy—not just those seeking to come together in unions. Numerous studies show that by forming unions, workers can negotiate for higher wages and benefits.56 Looking specifically at contracting, they also help ensure that prevailing wage laws are properly administered and enforced.57 Moreover, when unions are strong, higher wages and benefits can spill over into other nonunion workplaces.58 Finally, research shows that unions help ensure that government works for everyone—not just the wealthy few—by encouraging working people to vote and by providing a unique counterbalance to wealthy interest groups on economic issues.59 For these reasons, policymakers should make strengthening worker organizations—as well as raising wages for taxpayer-funded work—a top priority. All companies receiving financial support from the federal government should be required to pay decent wages, provide good benefits, refrain from discrimination, comply with workplace laws, and respect workers’ rights to join a union and bargain collectively. Pro-worker lawmakers should fight against efforts to weaken standards for workers on federally supported projects and should oppose any major infrastructure proposal that does not create good jobs. Beyond these imminent battles, lawmakers should advocate for new government policies to ensure that all government spending—including federal contracts, grants, loans, and loan guarantee programs—create good jobs and provide new tools to build power and voice for working Americans. In recent years, anti-worker lawmakers implemented a number of these measures at the state level as they also advanced legislation to weaken workers’ ability to organize into unions. Efforts to repeal prevailing-wage laws advanced at the same time as states were enacting right-to-work laws, measures that weakened protections for public-sector workers, and laws pre-empting cities from enacting wage standards.64 If anti-worker lawmakers are now successful at the federal level, American workers on federally supported projects will earn significantly lower wages, have fewer protections, and have less power on the job. Policymakers who care about workers must remain united in their opposition to every effort by the president and anti-worker lawmakers to weaken standards for workers on federally supported projects. Pro-worker lawmakers should also advocate for policies to require that all government spending creates good jobs. This will require expanding wage, benefits, and discrimination protections that currently apply primarily to jobs funded through federal procurement to grants, loans, loan guarantees, and tax expenditures. In addition, policymakers should strengthen minimum wage standards, protections for workers seeking to join together in unions, and Buy America and Buy American protections. The Center for American Progress has already called on wage and benefits protections to be included in a federal infrastructure package.67 While President Trump promised a $1 trillion investment in infrastructure and noted at a speech before North America’s Building Trades Unions that real wages for construction workers have fallen 15 percent since the 1970s,68 thus far, he has not committed to including wage protections on all jobs created through the spending.69 Moreover, the Trump administration has signaled that it may structure the infrastructure investment in a way that is less likely to include even prevailing-wage standards—by relying on public-private partnerships funded through tax breaks.70 Lawmakers who care about workers should ensure that any infrastructure package creates good jobs for all taxpayer-supported work. More broadly, the government should take steps to ensure that job quality standards are attached to existing and new spending programs. The federal government has regularly acted to extend Davis-Bacon Act prevailing-wage requirements to construction jobs funded through grants, loans, loan guarantees, and even some types of tax credits. Yet despite skyrocketing federal spending to support service-sector jobs, the wage protections enumerated under the Service Contract Act have never been extended beyond contracting in the more than 50 years since the law was enacted. Job quality standards should apply to grants, loans, loan guarantees, and tax expenditures when the work occurs within the United States and its territories, the federal government is a significant market actor, and the principle purpose of the work is to construct or maintain American infrastructure or to furnish services through the use of service employees. As is the case with existing protections for the contracted workforce, job quality standards would also flow down to the workforce of subcontractors. This would include any jobs created by a major federal infrastructure bill, including ongoing service and maintenance jobs that result from the federal funding; federal health care assistance such as Medicaid, the Children’s Health Insurance Program, and TRICARE; school nutrition assistance including the National School Lunch and Breakfast programs; federal financial aid loan and grant programs including Pell Grants, Direct Subsidized Loans, and Perkins Loans; and early childhood programs such as Head Start and Child Care Development Block Grants. However, it would exclude programs such as Supplemental Nutrition Assistance Program benefits, where the primary purpose of the program is to allow Americans to purchase food, rather than providing services. In addition, the administration must evaluate whether other financial assistance programs should be covered by these requirements. When a new financial assistance program is created to support infrastructure investments or provision of private-sector services, there would be a presumption of coverage under job standard requirements unless an agency can provide a compelling reason for exclusion. Extending these protections to contracts, grants, loans, loan guarantees, and tax expenditures that directly and fully fund private-sector jobs would be relatively straightforward. More extensive rulemaking and evaluation may be required for programs that flow through state governments and need additional support. Pay nonpoverty wages: Prevailing wage laws, such as the Davis-Bacon Act and the Service Contract Act, ensure that federal spending does not drive down standards, as well as help support good middle-class jobs in areas where unions are strong. Yet in too many communities, the prevailing wage is still poverty-level. A $15-per-hour minimum wage would ensure that hard work pays and would build on President Obama’s Executive Order 13658, which raised the minimum wage for federal contractors to $10.10 per hour. Companies receiving taxpayer support should be required to pay the prevailing wage or a $15 minimum wage, whichever is higher. Moreover, prevailing-wage calculations should be strengthened to foster high industry standards. For example, policymakers can follow the lead of a number of cities and states, such as New York, Maryland, and Jersey City, New Jersey,71 that have adopted policies to help ensure that collectively bargained wage rates are also the prevailing-wage rates. They can do so by setting the wage that prevails under both Davis-Bacon and the Service Contract Act to the wage paid to 30 percent of workers in an industry in that locality. Provide decent benefits: These should include health and welfare benefits required by existing prevailing-wage laws72 and at least seven days of paid sick leave, as provided in President Obama’s Executive Order 13706. Respect workers’ rights to join a union and bargain collectively: Existing policies require that contract recipients post notices informing employees of their right to bargain collectively; require successor service contractors to provide a right of first refusal for workers employed on the previous contract; encourage government agencies to use project labor agreements on large construction projects; and prevent companies from using federal funds to fight the efforts of workers to form a union.74 These protections should apply broadly to federal financial assistance programs. Not persuade workers in union selection processes: Even when workers are covered by existing federal protections, it is still far too easy for anti-union companies to fight workers’ efforts to join together in unions and negotiate for better pay and benefits. To ensure that workers who want to form a union have a fair shot at doing so, companies should be prohibited from attempting to persuade workers employed on taxpayer-supported work to exercise or not to exercise the right to organize and bargain collectively. Finally, the portion of a company’s employees covered by a specific provision would vary. Wage, benefit, and union neutrality requirements would apply to all workers performing work on or in connection with a covered assistance program, as is currently the case for federal contractors covered by existing minimum wage requirements.81 Existing discrimination protections for contracted workers are much broader—covering a beneficiary’s entire workforce. Anti-discrimination requirements on other types of assistance should also cover a company’s entire workforce. Likewise, companies should be required to report on their full record of compliance with workplace laws—not just compliance with laws on work funded with taxpayer support. By implementing these reforms, policymakers would not only raise standards for working people, but, as research on the effects of contracting job standards demonstrates, also ensure that businesses that respect their workers can compete on an even playing field and provide taxpayers good value for their investment. While the federal government has been slow to extend many job standards to jobs funded though nonprocurement spending, state and local governments are increasingly expanding wage standards beyond contracting to other types of spending, including economic development spending, contracts for vendors, and requirements on heavily regulated industries. Finally, by raising workplace standards among government contractors, state and local governments can ensure that taxpayers receive a good value. Every year, the federal government pays private-sector companies hundreds of billions of dollars to deliver essential public goods and services. By attaching job quality standards to all of this assistance, policymakers can raise standards for millions of workers and help create the kind of economy that all Americans want—an economy that supports high-wage job growth; ensures that businesses that respect their workers can compete on an even playing field; and makes sure that taxpayers get good value for their investment. Moreover, by granting workers more stability and more power in the workplace, policymakers can ensure that workers will be better able to advocate for themselves in our democracy and provide a more effective counterbalance against wealthy special interests. Indeed, these are the goals and values that motivated American policymakers more than 100 years ago to first innovate by attaching job quality standards to contracted construction work. By harkening back to these goals today, lawmakers who care about working people can create a bold vision that is needed to push back against attacks on existing job standards and build wide-ranging support for the expansion of these programs. Karla Walter is Director of the American Worker Project at the Center for American Progress Action Fund. Walter focuses primarily on improving the economic security of American workers by increasing workers’ wages and benefits, promoting workplace protections, and advancing workers’ rights at work. Prior to joining CAP Action, Walter worked at Good Jobs First, providing support to officials, policy research organizations, and grassroots advocacy groups striving to make state and local economic development subsidies more accountable and effective. Previously, she worked as an aide for Wisconsin State Rep. Jennifer Shilling (D). Walter earned a master’s degree in urban planning and policy from the University of Illinois at Chicago and received her bachelor’s degree from the University of Wisconsin-Madison.